I use my Sennheiser HD 280 Pro headphones on an almost daily basis, and I think they are probably one of the best headphone buys out there. 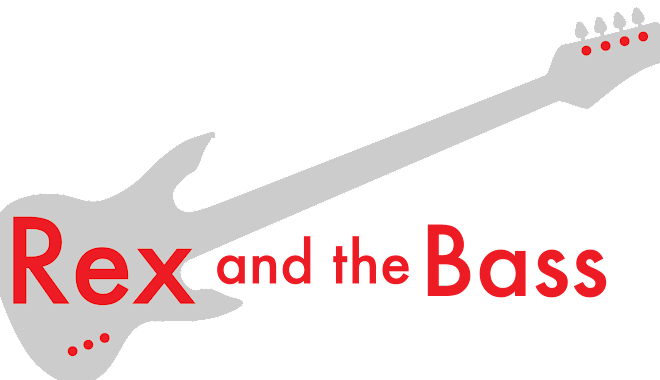 Though their price is relatively low in the high-fidelity world (around a hundred bucks), you might be looking for something a bit cheaper. 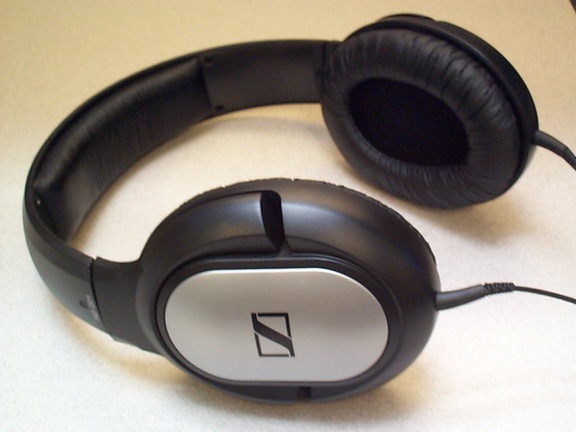 Well, I recently had the chance to try out Sennheiser’s HD 201 headphones, and depending on what your needs are they might be just the ticket for you. The HD 201 cans are closed-back over the ear (circumaural) cans with a 3-meter cord and an 1/8-inch jack. A gold-plated ¼-inch adapter is included. They do not come with any sort of carry case of bag, but how many extras can you expect at this price point? The ear cup have padded black naugahyde covers, and they are mounted to pivots that allow them to tilt back or forwards (about 20 degrees worth). This helps them fit differently-shaped melons, and lets you leave one cup in place in case you need to slip the other off the ear for a bit. The padded headband is adjustable and fits my head well. I think the top of my head is kind of flat, so take my observations for what they are worth. A pair of the HD 201 headphones comes in at around 6 ounces, according to my digital scale. There is a fine line between making these things light enough so that they are comfortable, but not so light that they feel flimsy and cheap. Unfortunately these ones fall on the flimsy and cheap side of the line. But that is just my first impression. I have banged these things around quite a bit and nothing has broken off of them and they still sound the same. It appears that they will last for quite a while. Though the resistance is considerable less than my HD 280 Pro headphones (24 Ω), the HD 201s do not put out much volume. Perhaps the neodymium magnets in the HD280s give them more oompf. Anyway, these headphones benefit greatly from using a headphone amplifier (like a CMOS), so they are not going to be great for portable use. The cups seem to seal well, so your cubicle mates will not have to listen to your crummy music that leaks out around the edges. As you have probably figured out, there are a few downsides to these headphones. If you want them for listening in the office or at home, you are in luck. But if you are in a noisier environment and you will have to crank the volume on your iPod to make them loud enough to hear. Plus you are not going to want to take these to the gym as that 10-foot cord gets hung up on fricking everything. 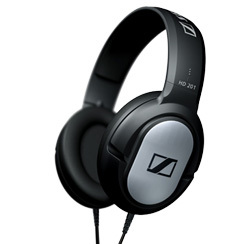 The MSRP for a pair of Sennheiser HD 201 headphones is $29.95, and I usually see them for around $25. Doing an online search I found a pair of new ones on Amazon for $21.95, which is way cheaper than the price of a pair of nice ear buds, and you will surely get a lot better sound out of them. By the way, make sure you get these from an authorized dealer, as they come with a 2-year warranty.